Download a safety poster from the FOA! When most people think of safety in fibre optic installations, the first thing that comes to mind is eye damage from laser light in the fibre. They have an image of a laser burning holes in metal or perhaps burning off warts. While these images may be real for their applications, they have little relevance to most types of fibre optic communications. Eye safety is an issue, but usually not from light in the fibre. However, fibre optics installation is not without risks. Optical sources used in fibre optics, especially LEDs used in premises networks, are of much lower power levels than used for laser surgery or cutting materials. Even the output of OTDRs, WDM and fibre amplifier systems, which are much higher than LED systems, are still well below that used in laser surgery or machining. The light that exits an optical fibre is also spreading out in a cone, so the farther away from the end of the fibre your eye is, the lower the amount of power your eye receives. If you are using a microscope, which can efficiently focus all the light into your eye, it should have infra-red filters to reduce the danger of invisible infra-red light. The infra-red light in fibre optic links is at a wavelength that cannot penetrate your eye easily because it's absorbed by the water in your eyeball. Light in the 1300-1550 nm range is unlikely to damage your retina, but might harm the cornea or lens. A typical laser pointer, which has a beam that is collimated (not expanding), and is at visible wavelength (650 nm) where the eye is transparent, is probably more danger to the retina than a fibre optic link. That being said, it's not a good idea to look into a fibre unless you know no source is being transmitted down it. Since the light is infra-red, you can't see it, which means you cannot tell if there is light present by looking at it. You should always check the fibre with a power meter before examining it. The real issue of eye safety is getting fibre scraps into the eye. As part of the termination and splicing process, you will be continually exposed to small scraps of bare fibre, cleaved off the ends of the fibres being terminated or spliced. These scraps are very dangerous. If they get into your eyes, they are very hard to flush out and will probably lead to a trip to the emergency room at the hospital. Whenever you are working with fibre, wear safety glasses! The broken ends of fibres and scraps of fibre created during termination and splicing can be extremely dangerous. The ends are extremely sharp and can easily penetrate your skin. They invariably break off and are very hard to find and remove. Sometimes a pair of tweezers and perhaps a magnifying glass will get them out. Most of the time, you have to wait to let them infect and work themselves out, which can be painful! Be careful when handling fibres to not stick the broken ends into your fingers. Dispose of all scraps properly. Some people keep a piece of double stick tape on the bench to stick fibre scraps onto. I prefer to use a dedicated container for all fibre scraps. In our training programs, we use the same paper containers used for takeout at the deli, in the pint size, with a lid. We put all the scraps in the container, then when finished, put on the lid, tape it and dispose of it later. Do not drop fibre scraps on the floor where they will stick in carpets or shoes and be carried elsewhere-like home! Obviously do not eat or drink anywhere near the work area. Fibre scraps can get into food or drink and be swallowed. The scraps can embed themselves in you digestive system and never be found. Doesn't sound too appetizing, does it?! Fibre optic splicing and termination use various chemical cleaners and adhesives as part of the processes. Normal handling procedures for these substances should be observed. If you are not certain of how to deal with them, ask the manufacturer for a MSDS. Always work in well-ventilated areas. Avoid skin contact as much as possible, and stop using chemicals that cause allergic reactions. Even simple isopropyl alcohol, used as a cleaner, is flammable and should be handled carefully. Note that fusion splicers use an electric arc to make splices, so care must be taken to insure no flammable gasses are contained in the space where fusion splicing is done. Splicing is never done in manholes where gasses can accumulate. The cables are brought up to the surface into a splicing trailer where all fibre work is done. Of course the splicing trailer is temperature-controlled and kept spotlessly clean to insure good splicing. Smoking should also not be allowed around fibre optic work. The ashes from smoking contribute to the dirt problems with fibres, in addition to the chance of explosions due to the presence of combustible substances. You might be wondering what electrical safety has to do with fibre optics. Well fibre cables are often installed around electrical cables. Electricians are well-trained in electrical safety, but some fibre optic installers are not. We've heard rumours of fibre installers being shocked when working around electrical cables, but know that two fibre installers were killed when working on aerial cables because we heard about it from OSHA. These two installers were installing all-dielectric self-supporting aerial cables on poles. The hangers, however, were metal and over six feet long. Both had attached the hangers to the poles, then when installing the fibre cables had rotated the hangers enough to contact high-voltage lines. So even if the fibre is not conductive, fibre hardware can conduct electricity or the installer can come in contact with live electrical wires when working in proximity to AC power. 2. Wear disposable aprons to minimize fibre particles on your clothing. Fibre particles on your clothing can later get into food, drinks, and/or be ingested by other means. 3. Always wear safety glasses with side shields and protective gloves. Treat fibre optic splinters the sarne as you would glass splinters. 4. Never look directly into the end of fibre cables until you are positive that there is no light source at the other end. 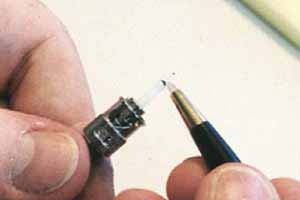 Use a fibre optic power meter to make certain the fibre is dark. When using an optical tracer or continuity checker, look at the fibre from an angle at least 6 inches away from your eye to determine if the visible light is present..
5. Only work in well ventilated areas. 6. Contact wearers must not handle their lenses until they have thoroughly washed their hands. 7. Do not touch your eyes while working with fibre optic systems until they have been thoroughly washed. 8. Keep all combustible materials safely away from the curing ovens. 9. Put all cut fibre pieces in a safe place. 10. Thoroughly clean your work area when you are done. 11. Do not smoke while working with fibre optic systems. These are the issues that need considering for working safely!